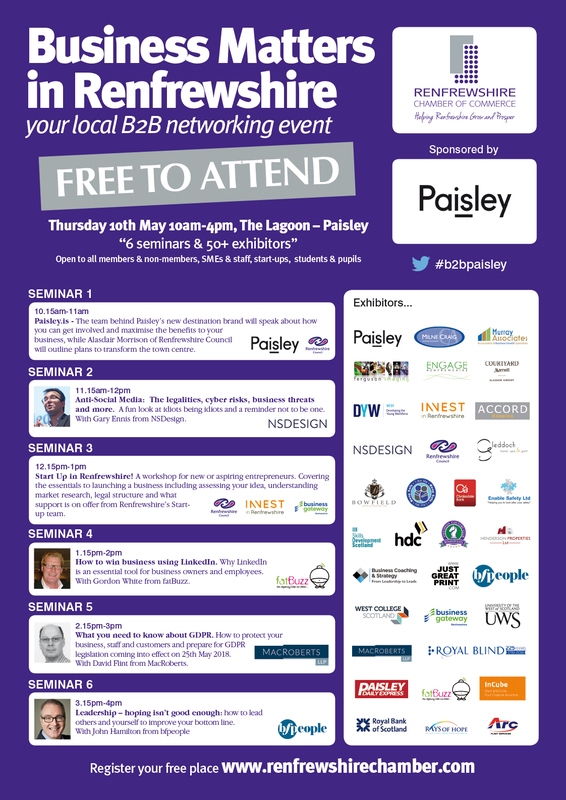 Renfrewshire’s largest free business event returns to Paisley for the 8th consecutive year on Thursday 10th May at the Lagoon, Paisley. “Business Matters in Renfrewshire –your local B2B event” is organised by Renfrewshire Chamber and is open to all members & non-members, business people, start-ups, senior school pupils and students. With 50+ exhibitors and 6 seminars running throughout the day the event is sponsored by Paisley.is, the new destination brand for Paisley & Renfrewshire. For more information and to register your place please visit the Chamber events page at www.renfrewshirechamber.com The event is free to attend (there is a cost to exhibit).